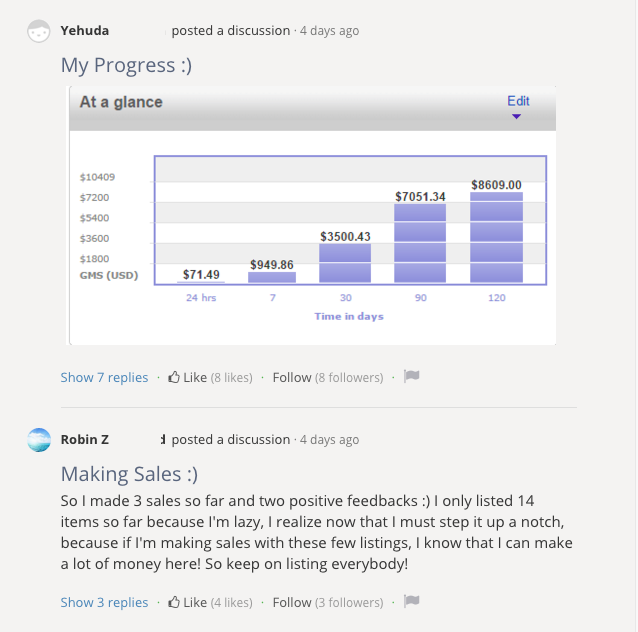 I absolutely love hearing the success of others, especially people who I've helped point in the right direction. 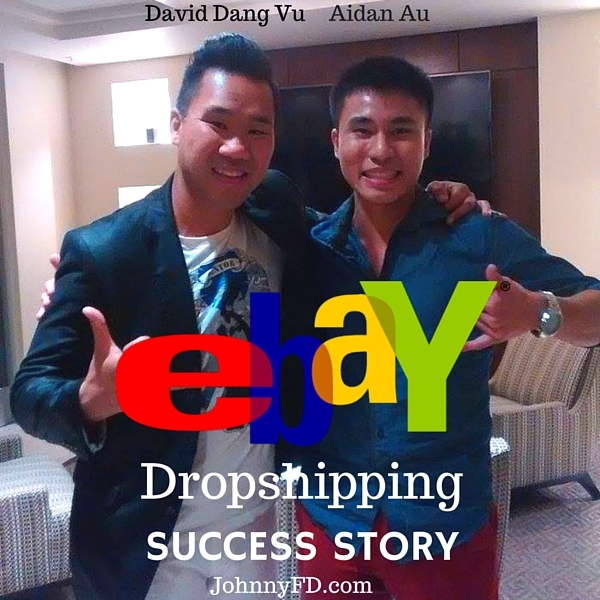 A few months ago I had David Vu on my podcast as a guest because I wanted to pick his brain about dropshipping on eBay. He had a course on it that I was skeptical of at first because price arbitrage and dropshipping on eBay has a terrible reputation as something that is gimmicky and doesn't work. 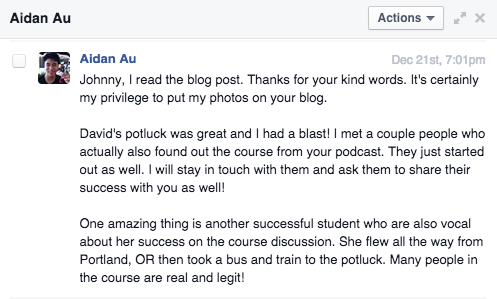 But after speaking with David for an hour over the phone and having him openly and honestly answering all of the tough questions I had prepared, not only did I pay for and sign up for his course myself, I also started recommending it to my friends, readers and podcast listeners. Aidan Au was one of those people who followed my recommendation and this is his success story. Every week I interview a different location independent entrepreneur on my show the Travel Like a Boss Podcast. Almost every single week enough value is squeezed out of the guest, that listeners could pretty much just replicate their success. The reason why I love doing these interviews is because I get to find out first hand what is actually working, and what people's secrets to success are. My goal is to share what works, and to build an army of digital nomads who are all making enough money to be location independent. Out of the 20,000 downloads I normally get per month, I'm curious how many people actually take action as I obviously don't hear from them all. The good thing is, once in awhile I do. 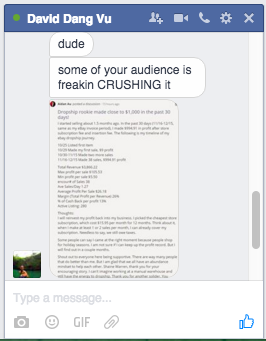 This was the first message I got from Aidan almost two months ago after I first interviewed David a few weeks prior. It wasn't until a few days ago that I realized how well Aidan is actually doing. I've been so busy doing my own thing, and I hear from so many people that unless someone reaches out to let me know what's going on, I kind of just assume people have either gotten busy with life, their career, the holidays or just given up. I think what we can all learn from Aidan is that hard work really pays off, especially when you follow the footsteps and teachings of someone who is actually successful and is willing to share what has worked for them. After interviewing David, I was super curious to see his store example as I wanted to go through the sold listings to see what he was selling, what actually sold, and how it all worked. Right away I knew he was legit as I could actually see his completed listings. But even better than that, I got access to the private member discussions that showed me that he was actually replying and personally helping his members. If you want to see for yourself, you can sign up for David Vu's Course here. One thing that really impressed me about Aidan is the fact that he not only puts in the work to be successful himself, he also takes the time to give back and help others succeed. I think it's the abundance mindset that has helped him become as successful as he is today, and will help him really get to the next level in the future. What's really cool about David is the fact that he's inviting his students over for potlucks just so they can get to know each other, hang out and meet one another. I haven't met David yet, but when he heard I was going back to the U.S. for the holidays, he offered me one of his AirBnB listings to stay at for free while I'm in Southern California. What's even more awesome is seeing how many other students in his course are posting screen shots on their dashboards showing their success. 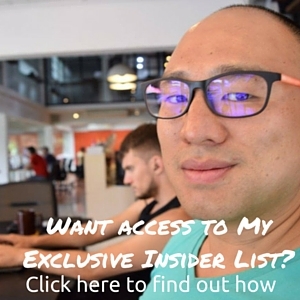 I really think that by sharing his info, he's going to get his students to their first few hundred or thousand in profit per month, then be able to create even higher end programs or courses to take their success as well as his own empire to the next level. Here's a photo of David and a group of his students at his most recent meetup in Dallas, TX. He's a big reason why I've opened up my schedule to meet up with listeners of the podcast as well as my own course students during this trip back home. So if you live near Austin, Los Angeles, or San Francisco make sure you rsvp in the Travel Like a Boss Army facebook group here. Running your business teaches other web skills and marketing. Works for people of all countries, not just Americans. Or if you want a full review and hear the interview I did with David to find out more, check out this post here. Aidan and a bunch of other members just met up with David Vu over the holidays for their first member's potluck. Here's an awesome video with some testimonials from other students who are doing just as well as Aidan or even better! 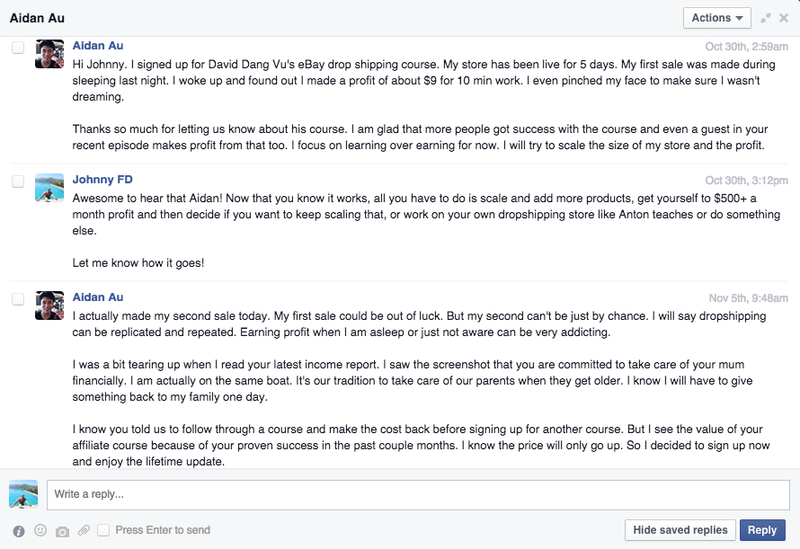 1st Udemy Potluck / Drop Shipping Success Stories! Best wishes in your success! Let me know how it goes! P.S. Here's the discount link to David's Course! Are any of the profiles of these successful eBay dropshippers available or are they all 'secret' to protect the items sold? I ask because after a while bad feedback wipes out most who try this, either from supply issues, bad buyers, or something as ridiculous as a buyer upset getting an AZ box/invoice (if using AZ), regardless of if they've saced money or not. I know as I've done it myself, through multiple accounts and various suppliers/items/niches. There are far too many pitfalls and things not under your control, and the little profit to be made is not worth the headaches or account losses. 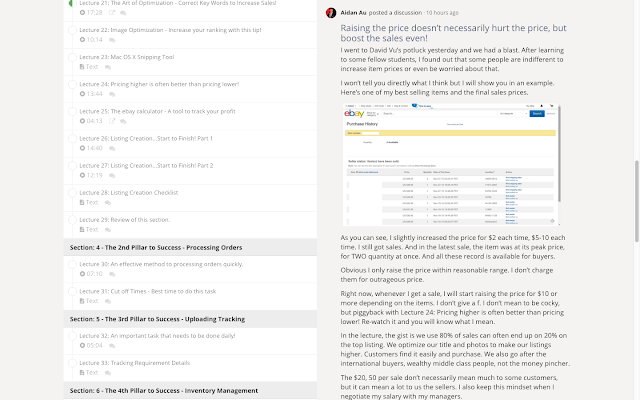 Most of them are secret to protect the items they are selling, but David Vu shows his account inside the course and how he gets around negative feedback. Some other students inside the course mentioned those fears as well, and so far they've all said it hasn't affected them. 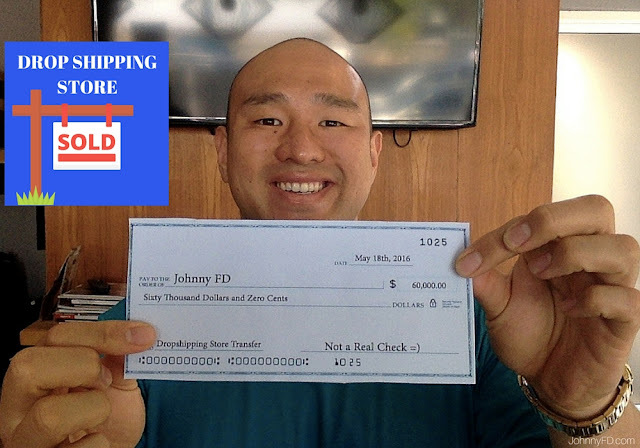 I don't think eBay arbitrage is a long term play, but as I mentioned in the interview, I think it's a fantastic way to get started in online business, make a few thousand dollars and gain the skills and confidence it takes for any online biz to work. "The ONLY THING that makes this system difficult is the various return situations you can face as a drop shipper. Even within the course, you'll find tons of people on the inside of this course asking return-related questions. Things like International Shipping Return problems when a buyer needs to make a return and you the seller need to reach out to the Source (Home Depot, Lowes, Etc.) to get a return done and all the Source offers is a U.S. shipping label (not an international shipping label) for the return. This can potentially be a very annoying problem. Defective Item Situations, Wrong Item Sent Situations, not to mention the irate one-off situations where a buyer accuses you of ripping them off. David doesn't really answer these Return situations in detailed terms. In the Discussion Boards, it's answered generally, but often dismissed with a "It's something you'll have to learn on your own, but here's some general things to keep in mind" kind of thing (paraphrasing mine)." That, and 99% of 5 star reviews are posted before people have even bothered setting up listing to see if it works. They're just reviewing the course, not results, which is hardly a realistic look at it. Whether they're convinced to add an early review i don't know, but it's very misleading. I didn't reply to your comment right away because I didn't have much insight on what you mentioned, but after meeting a bunch of David's students in person while back in Southern California and asking them about it, they all said it's not a big deal and they've all been doing it for months without issues they couldn't figure out or handle. Most of them are making $700+ a month in profit. By investing $300 in stock you would be making 30 cents a month on average in dividends and growth. 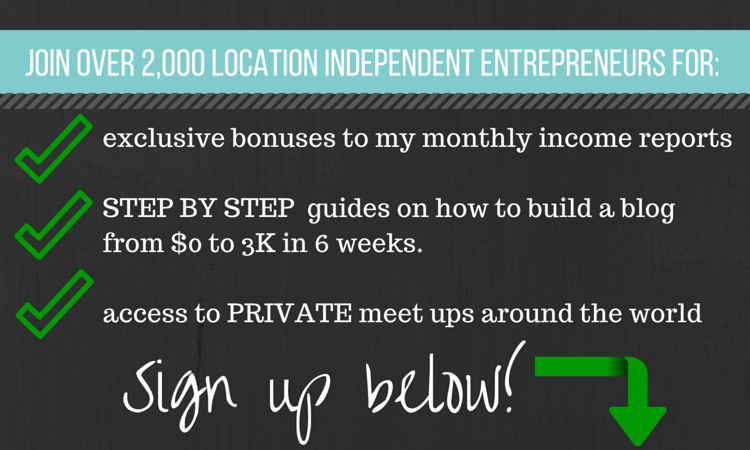 Having the potential to make $700 a month is a much higher ROI. Stock to sell I mean, not the stock market. That makes a bit more sense. 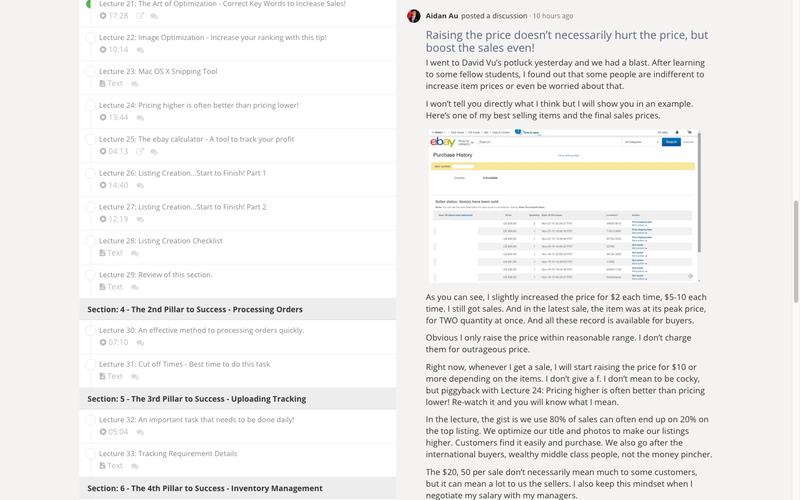 You would definitely get a bit more margin if you bought $300 worth of items at wholesale somewhere (maybe alibaba) to sell. But the problem is it's not scalable, and by the time you get the money to reinvest it'll be 2-4 weeks. 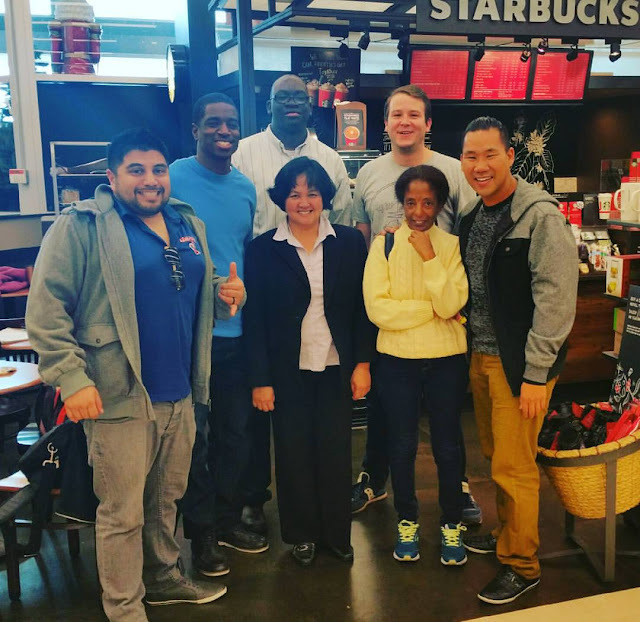 With David Vu's dropshipping model, you can scale your business much quicker. Even with all of the potential downsides. You did bring up a lot of interesting questions through so I made sure to ask them when I met a bunch of David's students in person. I'll have a listen, thanks. Glad to hear those guys got out of MLM schemes, they're absolutely the worst, preying on the naive and vulnerable. I would say almost many successful students in the course just list anything or everything first. In that way, we can avoid "paralysis through analysis". 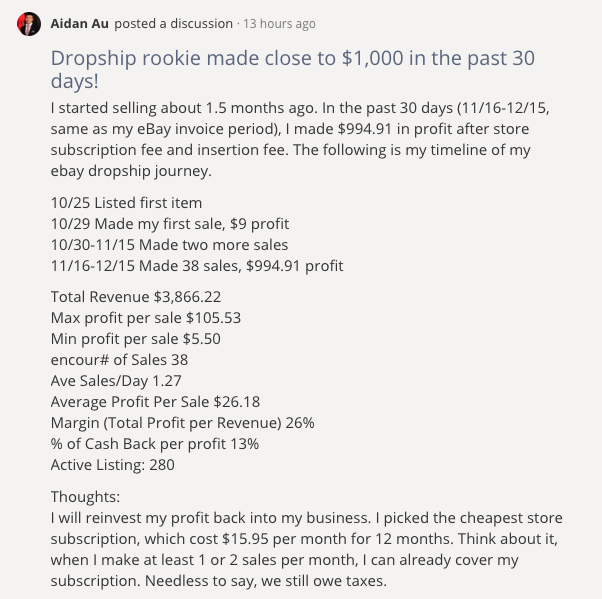 The biggest advantage of dropshipping on ebay is that people can see small wins earlier. Of course not everyone get the same results that quickly. But it's not uncommon to see people with fast small wins. "Early wins are critical for momentum. ", Tim Ferriss. The second advantage is that the start up cost to low to no. Owning an eBay and a paypal account is essentially free. Hmm I wonder what's happening with your store that you're not making sales. Try messaging a link to your store to David so he can take a look for you. Also are you active in the member discussions? Hopefully it's just a small thing you can tweak to make it a success. Let me know when it turns around!